The Division was established in October1936 in Hamburg. On 26 August 1939, the Division was mobilized as part of the first wave in the invasion of Poland. At the beginning of the Polish campaign, the division was a part of Army Group South . On the Bzura they suffered heavy losses, as they had to reject violent counter-attacks and attempts to break out by the encircled Polish troops. Their commander, Major General von Briesen personally led his last reserve battalion into battle, he was wounded while and lost his right forearm. The division, henceforth was referred to as “Briesen-Division”. Soon after, they were sent to France. The division fought its way through France and secured the beach head. While starring down the English, they prepared for a beach landing in a mission dubbed "operation sea lion." This mission was cancelled and the division soon found itself on the Eastern front facing the Soviets. In May 1941, their relocation was to East Prussia, where at the beginning of the Russian campaign they were assigned to the Army Group North and had to overcome the order of Soviet frontier defenses south of Memel. Lieutenant White from the 30 Engineer Battalion created gaps in the barbed-wire entanglements, then move up what infantry regiments the division could spare. The resistance of the Red Army did not begin until after the grenadiers approached their fortified positions. Despite the Russian's heavy artillery and assault guns the 30th ran right over them. The Red Army had been overrun by Germany’s first wave of attacks. The division then took up the fight in an ambush by snipers targeting controlling rear units, officers, troops and mine detectors. 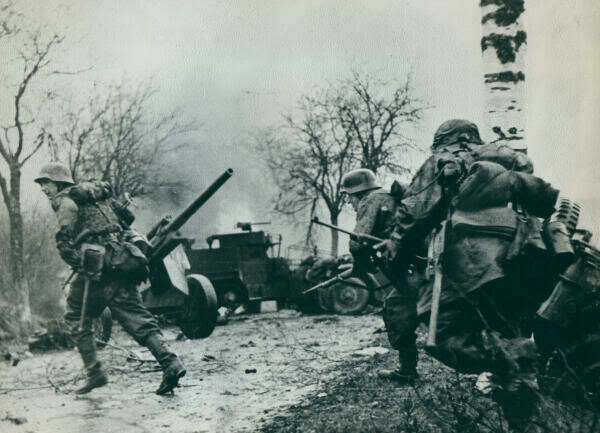 They fought on, battle after battle until It developed into a defensive struggle in February 1942. The Demyansk pocket found trapped German divisions, including the 30th Infantry. After the evacuation of the battle at Demyansk was done, she took over the defense of Staraya, where she took part in defensive battles. Their defensive front was extended until Ilmensee and later to Shimsk. With the beginning of the Soviet winter offensive in January / February 1944 the 30th had vacated their positions and retreated. The division was now east of Ostrow, and later south of Pskovin. The defensive struggles, the fighting withdrawals down through to the Baltic states. The division fought in the “Marienburg” position, fought on Embach and retired in October via Rigaback to Kurkland. In Kuntil it was torn apart in early June by Soviet troops and taken into captivity.